The Ernie Ball Music Man Bongo HH 5 String Bass features a distinctively carved basswood body that comes finished in an awesome Firemist Purple finish. The ergonomic double-cutaway design offers maximum player comfort and gives this bass a look that truly stands out among any other bass. The Music Man designed 5-bolt neck joint is sculpted for smooth upper fret access and is strong and stable with no shift in the neck pocket for superior tone transfer. The 34 -scale neck is carved from select maple and sports an 11 -radius rosewood fingerboard with 24 high profile, wide frets for superb playability and fretting hand comfort. A pair of Music Man neodymium humbucking pickups deliver a noise-free, warm tone with plenty of low-end clarity and punch. Shape your sound to perfection in every frequency with the active 4-band preamp that consists of a volume control, a bridge/neck pickup balance control, and treble, bass, high-mid low-mid controls.The Standard Music Man bridge features a hardened steel bridge plate with stainless steel saddles that allows for precise adjustments and stability. Rounding out the black hardware are a set of Custom Music Man lightweight, ergonomic tuning machines and a familiar oval-shaped pickguard to give this bass an identity that is undoubtedly Music Man. 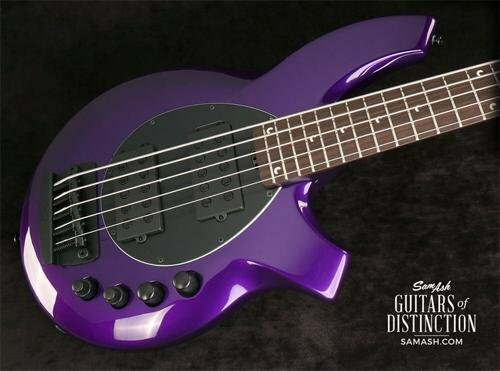 A hardshell case is included with your purchase of this Music Man Bongo 5 HH 5-String Electric Bass Guitar.Get your Ernie Ball Music Man Bongo 5 HH 5-String Electric Bass Guitar Firemist Purple from Sam Ash Direct today. With over nine decades of experience in the music retail business, Sam Ash is dedicated to helping every player and collector find the distinctive instrument that they've been longing for. And remember, your purchase is protected by the security of our 45/60 day return/price protection policy. If you have any questions about this product by Ernie Ball Music Man, contact us by completing and submitting the form below. If you are looking for a specif part number, please include it with your message.